Qualification: BE/B.Tech or equivalent qualification in first class with an aggregate minimum of 65% marks (average of all semesters for which results are available) or CGPA 6.84 on a ten scale. Minimum of 65% marks or CGPA 6.84 in section B alone for candidates with AMIE/Grad IETE qualification. Candidates who are going to complete the above course in the academic year 2015-16 are also eligible to apply provided final Degree is available by 31/8/2016. How to Apply Candidates satisfying the above eligibility conditions have to apply through online registration From Official Website: http://www.isac.gov.in/ and send the duly filled in application along with the copies of Certificates (self attested) in support of Educational and Technical qualifications, Community etc. & candidate has to send one part of the challan form [ISRO copy] to Sr. 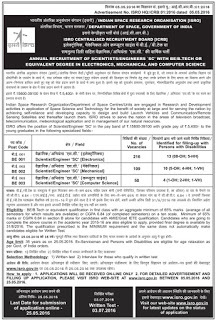 Administrative Officer(ICRB), ISRO Headquarters, Antariksh Bhavan, New BEL Road, Bengaluru - 560094 by "ORDINARY POST ONLY" superscribing on the envelope "ICRB - RECRUITMENT OF SCIENTIST/ENGINEER 'SC'" within 7 days of filing of application and in any case not later than 01/06/2016.